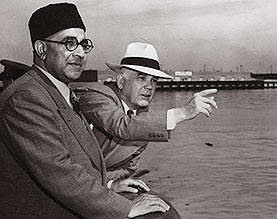 "I have spoken to you with great candor and from the depth of my heart for we are a simple and frank people as you are"
Liaquat Sahib made two mistakes in this sentence. 1) We are a simple and frank people. No, we are a Naive people. 2) "...as you are." :) Sir, no further comment is required to elucidate why this was an error, I suppose. Historically, the american govt. 's personality has usually been far from that of its people. Hence, yes in respect of the "people" of US, the statement is correct. However, I suppose the Collective Ego of the US people is yet to manifest itself. Some of the other assumptions have also proved to be drastic in hindsight. "You have no colonies and I believe no territorial ambitions"
A much better tone was perhaps set by the Quaid himself earlier than this occasion. The occasion was when the first US Ambassador to Pakistan presented his credentials to the Quaid. The Quaid's response exuded confidence as a nation. "we hold our freedom dear as you do and we love peace, if possible, even more than you do." Great statement from a great leader. We do Need such a great,bold,courageous and brave leader these days.Who can talk with his head UP with all. "you will find the people of Pakistan amongst your staunchest friends." I think,nowadays Every leader of Pakistan is following it with his heart and soul but have forgotten the conditions Liaqat Ali khan mentioned. We need to learn from our past experiences and from the lives of our successful national heroes. This post is one of the most powerful and current here and I want to do my part to gather more visibility for such timely and urgent words! Vagabonds Ventures, is there an alternative link to this one as this doesn't come up for me in a search? Thank you for your comments.